There's nothing like hot chocolate to help melt away the harshness of cold weather. This year I expressed my cocoa adoration in a fairy drawing. I finished coloring her in time to print on mini magnets for my coworkers' Christmas gifts last week and will be unveiling her to the rest of the world on the next Sunday Sketches. I fluttered around the office, giving everyone a magnet and a flavored Land O Lakes hot chocolate packet of their choice. 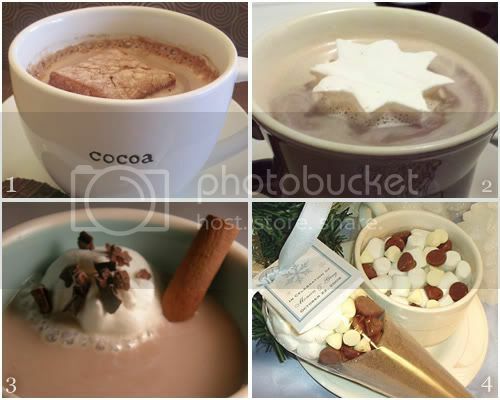 This week I took a stir around Etsy to get a taste of what homemade hot cocoa mixes are available. I wouldn't have been able to afford 30 of these delicious kits to give as gifts, but am considering treating myself. I usually top my hot winter drinks with whipped cream and a sprinkle of cinnamon, but am intrigued by the handmade marshmallows. Aren't those starbursts adorable?! They do look good. Hey, I use whipped cream and cinnamon, too. Happy New Year! Wow those all look amazing. Well... here's to a New Year full of sweet things! I love hot chocolate! Great idea for a feature post.